Mat Latos: Rotation Option, Bullpen Arm or just a clubhouse distraction? Grapefruit League begins tomorrow! But how long until the novelty of baseball wears off and we roll our eyes at the AAA fodder, prospects bound for Double-A ball, and pitchers stretching out and trying new pitches? 2 or 3 games, max? But hey, baseball is baseball, right?? Personally, I think the best part of the Grapefruit League is getting a look at the pitchers. I don't watch much minor ball, so to see Connor Greene actually pitch is exciting. And the fight for the last bullpen spots. And to see veterans give it one last shot before calling it a career. There's so many non-roster names you might not know, I've gone ahead and done some (half-assed) research for you! Mat Latos: It wasn't so long ago he was an elite pitcher (2013). But after playing for 8 teams over the last 8 years, Mat needs to to make this team more than the team needs him. I hear he's a real jackass in the clubhouse. Look for him to spot start, possibly fill in for an injured or an under-performing starter (ahem, Francisco Liriano), or most likely be a bullpen arm. Then again Dirk Hayhurst think he may be released before spring training ends, but I think he will prove a crafty signing (I thought the same thing last season with Johan Santana), even if he ends up a Scott Redmond type clean-up specialist. He may start the season in Buffalo, but if I were him I wouldn't buy too many green bananas. O/U GP 2017: 21.5 (mostly as a reliever). Gavin Floyd: Remember Gavin Floyd? I like the guy, for some reason, but he was shut down on June 25th last year with more shoulder issues. He did throw 31 innings with respectable numbers (1.000 WHIP and 30K's with only 8BB), BUT his shoulder is not yet 100% and he will most likely not be making the team out of spring training. Look for a call-up in May/June if he gets it together, but a lot of things need to go right for this guy to see any real playing time north of Buffalo. If I were him I'd rent a place month-to-month in Buffalo. Chad Girodo: Chad had a rough season in the pros last year. A 1.626 WHIP in Buffalo doesn't exactly scream bullpen arm, but he's a lefty and a homegrown talent who has had pretty damn amazing numbers in the minors. Maybe he's a AAAA arm. Maybe he's a LOOGY. Maybe he puts it all together this year. Maybe not. Brett Oberholtzer: After a promising rookie year with Houston back in 2013, Brett has become a nominal lefty relief arm. But on a team desperate for a lefty, he could see some time in Toronto. Let's see what he has to offer over the coming weeks, shall we? T.J House: Another Cleveland reclamation project. Ground ball specialist. Recovered from shoulder and eye issues. LEFTY. I think he's gonna get a lot of rope. Bisons don't have hands! This is blasphemy! 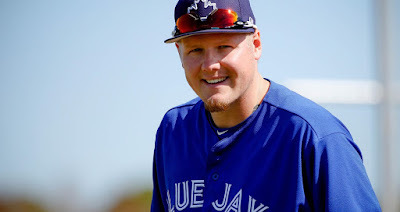 Lucas Harrell: A MLB leader in 2013 in two categories (in walks and losses), a lot of things would have to go wrong for Harrell to see much time in Toronto. Think Uruguayan Andes flight disaster. Wil Browning: How have I never heard of this guy? Undrafted, he has worked his way through the minors with an excellent strikeout-to-walk ratio (11.1/2.8), he's a ROOGY and would be the feel good story of the 2017 Grapefruit League if he were to make the club out of spring training. Not very likely. Get used to Buffalo Wil, I hear they have great wings, and see you in September, maybe. Leonel Campos: "Wild Thing" Leonel Campos averages over 12 strikeouts over 9, but walks 5. Buffalo bound. The bullpen is too deep for someone like him to squeeze in. Maybe he can gain some control in Buffalo. Jarret Grube: A 35 year old big righty who had a sip of coffee (0.2IP) in 2013. GO TO BUFFALO. DO NOT PASS GO. DO NOT COLLECT MLB PAYCHEQUE. I have decided not to include Connor Greene and Tim Mayza, because they are prospects. Also Mike Bolsinger, Garrett Sparkman, and the other guys on the 40-man roster. I'd love to hear YOUR thoughts here guys! That way when we look back at this post I won't be the only who made terrible, horrendous, completely wrong predictions!